- It's your 5th time meeting <The Star>, how do you feel? L: I feel like we're growing up together. Through <The Star> magazine this time, instead of INFINITE's side that the readers have already known, I want to show another charms. - Not a long ago, at M! Countdown, you wore caterpillar costume for 1st place encore stage and it was a hot topic/issue. You looked a bit rigid and it was cute. L: It was the most embarassing day in my life. It was a relief that the fans liked it, but i felt skepticism towards myself and felt sense of insanity too (*laugh*). - Is there any cosplay that you want for other members? L: Despite the costume, I'll cheer whatever it is if it's not me(*laugh*). That's why, I wished we wore it together since we got the 1st place together (*laugh*). - I heard that you wrote the lyrics directly of your first solo song in the album 'Reminisce'. You really match well with lyrical melody. 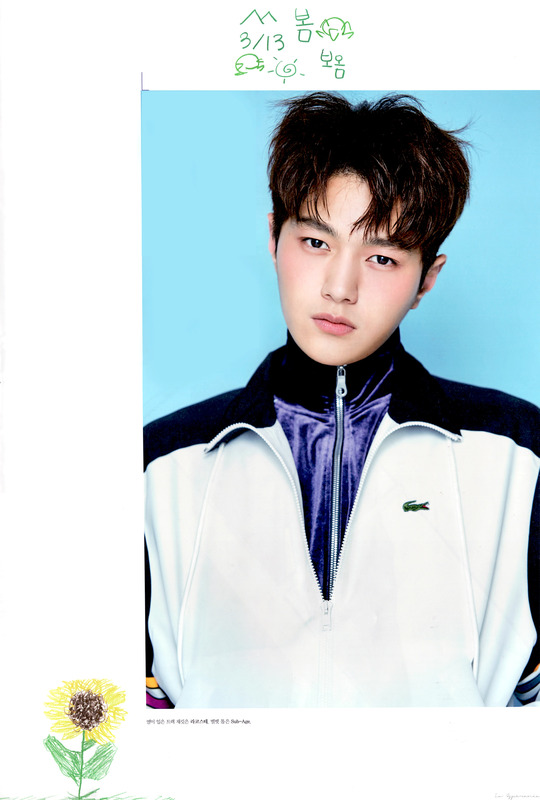 L: Originally, I like lyrical ballad songs. But, if I were to release a solo album in the future, I also want to try various genre, not only lyrical songs. L: It's nutrients (*laugh*). Nowadays, my body is not that fit so I ate vitamins a lot, I also receiving Ringer/IV. I also drink energy drinks. I have to maintain my health because I'll start filming for drama soon. L: (I do) when the house became really quiet? Sometimes I do miss it when we were noisy/playful. But not to the extent that I really want to go back (*laugh*). - If you have to live together again, which member do you want as roommate? L: Because we are now older, I want to have our own room (*laugh*). For two men in their late 20 (25 y.o and above) to stick together for a room is kinda weird, right (*laugh*). I think it's a good way to have our own place for living and the living room to share together. L: It's really embarassing and shy (to say it), but my fave one is 'MyongMyong-ie'. It's cute and good. It's not that I like cute things really much but there are times when I want to be looked/seen like a little kid. L: Yes. I think the 'INFINITE' itself is a fence. It is an existence that has really great memories. It has been with me more than half of my life.